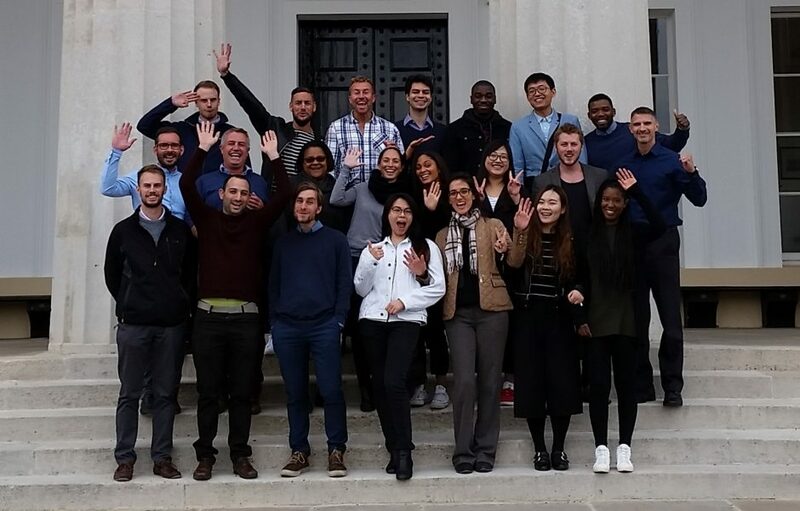 MSc Sport Business and Leadership students recently had the opportunity to visit the Royal Military Academy at Sandhurst. The day was filled with a variety of activities including academic sessions and talks delivered by academy personnel on leadership from a military perspective. Students also had the unique opportunity to take part in a special session with a prominent military commander and learn first-hand how his combat missions have shaped his leadership philosophy. Student, Phil, has written about his experience at Sandhurst. I started the first day of my Sport Business and Leadership course on the Thursday, on the Friday I stood on the hallowed steps of the Royal Military Academy at Sandhurst! It was definitely a truly humbling and exciting start to my studies. There was a notable buzz of eager anticipation amongst the Sport Business and Leadership class as we gathered at Waterloo station, awaiting the arrival of Dr Steve Swanson to lead us on our first field trip. The journey completed, we were served tea, coffee and biscuits in a rather grand room off of one of the main wings of the Old College building, before being given some insight into the history of Sandhurst and an introduction to military leadership. Inspired, we were led on a tour of the Academy, including the chapel, the parade ground and eventually the mess. During the tour I had the opportunity to chat with one of the officer cadets, and, having seen the badge on his uniform, I asked, “Is that your real name?” To which the response was, “Yes sir. It may be a problem should I attain the rank of Major!” He was Officer Cadet Risk! Whilst this text has Biblical inspiration, irrespective of faith or no faith, fact or fable, the point is that if ‘the Lord of all life’ can choose to serve, the clear expectation is that Sandhurst graduates will do likewise in bringing the college motto to life: ‘serve to lead’. Colonel Richard Westley, himself a Sandhurst graduate, was a commander of British forces on peace-keeping duties in Gorazde in 1995. According to his presentation at the Royal Military Academy at Sandhurst (Westley, 2016), his team was isolated, short on supplies, lacking air support and far from public recognition. In the course of what was supposedly a peace-keeping mission, Westley and his men regularly came under fire from the Serbian army as they sought to capture Gorazde, but their deployment only received the robust military intervention they needed when the government acknowledged that there was no peace to keep! Through his account of a testing period of action, Westley clearly demonstrated the application of ‘The Sandhurst Way’, serving to lead his troops and saving the lives of thousands of civilians. In testament to the effectiveness of the mission, it yielded the highest tally of peacetime medals since the Korean War. Our visit was both inspirational and humbling, and I consider it a real privilege to have not only visited this respected institution, but to have gained an insight into the lives of those who have learnt at and graduated from Sandhurst: Those who serve to lead. Loughborough University London would like to thank Phil Aiken for writing this blog post. Click the link to find out more about our MSc Sport Business and Leadership programme. We would also like to thank the Royal Military Academy at Sandhurst for their hospitality and engagement with the students.